As we discussed in Part 1, The Dangers of Passive Resuscitation, a patient in shock needs immediate treatment and 1 hour is too long to wait to correct hypotension. For a patient with MAP < 65 mmHg, our knee-jerk reaction might be to order a liter of fluid and a norepinephrine drip and think that we have done what we can to treat the patient. But, have you considered how long it takes to administer that bag of fluid? And how long will it take for the norepinephrine to come up from the pharmacy? Are there other options that would enable us to stabilize the patient more quickly? While push-dose vasopressors may buy time and augment blood pressure, tissue oxygenation and perfusion still requires adequate intravascular volume. In a large retrospective study of patients with septic shock, the lowest mortality was observed in those who received at least 1L of fluids in the first hour of shock and had vasoactive agents initiated between hours 1-6 after shock onset.6 Many other studies have also demonstrated improved outcomes with the use of early fluid resuscitation.7-10 However, our bedside experience with fluids in a critical situation can be underwhelming. We talk about shock as a medical emergency, yet standard fluid resuscitation is often anything but urgent. An IV pump max’d at “999” will take an hour to deliver 1 liter of saline. Assuming good IV or IO access, hanging a bag of saline “wide open” will be faster, but it will still take ~20 minutes. A pressure bag could help, but only if the provider is constantly re-inflating to provide adequate pressure, which rarely happens. These methods may be too slow in a hypotensive or shock patient. In Part 1 of this series, we introduced an actual case with a hemdynamically unstable patient. Our immediate goal was to restore perfusion. A norepinephrine drip was ordered, patient was placed on oxygen, IV access obtained, and a rapid fluid bolus was ordered to bedside. Using LifeFlow®, a 500mL bolus was delivered in 2 minutes and the patient’s BP immediately responded. After monitoring for signs of volume overload, another bolus was given and his mentation improved and blood pressure stabilized prior to the vasopressors even reaching the bedside. While the fluid boluses were being administered, a syringe of phenylephrine 100mcg /mL was prepared; however, it wasn’t used since the patient stabilized with the boluses alone. A chest X-ray confirmed the diagnosis of pneumonia and showed no evidence of pulmonary edema. The patient was admitted, required no further hemodynamic interventions, and was weaned off nasal canula oxygen within 6 hours. Immediate correction of shock and rapid administration of a fluid bolus prevented further escalation of end organ damage, invasive procedures, and excessive volume overload and ultimately led to a positive patient outcome. Fluids are readily available in the ED, but they must be delivered in an urgent and controlled manner. LifeFlow is an example of a device that can change our paradigm for fluid administration. It enables us as clinicians to administer a quick, controlled fluid challenge and intervene early in shock, potentially eliminating the need for other interventions. Our patient would be presenting in the “Salvage” phase, where administration of fluid boluses is indicated.15 This is a critical moment to intervene on a hemodynamically unstable patient with the goal to immediately augment preload and restore perfusion by using fluids. An early fluid challenge may provide both therapeutic and diagnostic benefits and observing the response may provide important clues on the underlying etiology of shock. 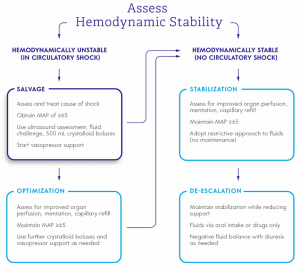 Once the patient’s shock is corrected and circulation restored, they would progress to the optimization and stabilization phases where fluid balance and caution against fluid overload are important considerations. In summary, there is no amount of time that is safe to allow our patients to remain in shock. Every minute matters. 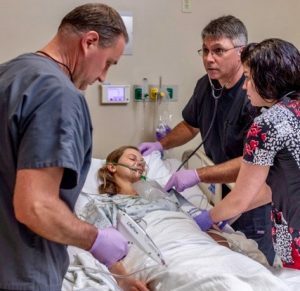 Push-dose pressors and rapid fluid boluses are tools that every provider should consider in the approach to a hypotensive patient. Siddik-Sayyid SM, Taha SK, Kanazi GE, Aouad MT. A randomized controlled trial of variable rate phenylephrine infusion with rescue phenylephrine boluses versus rescue boluses alone on physician interventions during spinal anesthesia for elective cesarean delivery. Anesth Analg. 2014;118:611-618. Awad NI, Mell HK, Swaminathan AK, Hayes BD. The authors respond: “Medication errors with push dose pressors in the emergency department and intensive care units. Am J Emerg Med. 2018;36:519-520. Schwartz MB, Ferreira JA, Aaronson PM. The impact of push-dose phenylephrine use on subsequent preload expansion in the ED setting. Am J Emerg Med. 2016;34:2419-2422. Acquisto NM, Bodkin RP, Johnstone C. Medication errors with push dose pressors in the emergency department and intensive care units. Am J Emerg Med. 2017;35:1964-1965. Holden D, Ramich J, Timm E, Pauze D, Lesar T. Safety Considerations and Guideline-Based Safe Use Recommendations for “Bolus-Dose” Vasopressors in the Emergency Department. Ann Emerg Med. 2018;71:83-92. Waechter J, Kumar A, Lapinsky SE, Marshall J, Dodek P, Arabi Y, Parrillo JE, Dellinger RP, Garland A, Cooperative Antimicrobial Therapy of Septic Shock Database Research G. Interaction between fluids and vasoactive agents on mortality in septic shock: a multicenter, observational study. Crit Care Med. 2014;42:2158-2168. Lee SJ, Ramar K, Park JG, Gajic O, Li G, Kashyap R. Increased fluid administration in the first three hours of sepsis resuscitation is associated with reduced mortality: a retrospective cohort study. Chest. 2014;146:908-915. Leisman D, Wie B, Doerfler M, Bianculli A, Ward MF, Akerman M, D’Angelo JK, Zemmel D’Amore JA. Association of Fluid Resuscitation Initiation Within 30 Minutes of Severe Sepsis and Septic Shock Recognition With Reduced Mortality and Length of Stay. Ann Emerg Med. 2016;68:298-311. Leisman DE, Doerfler ME, Schneider SM, Masick KD, D’Amore JA, D’Angelo JK. Predictors, Prevalence, and Outcomes of Early Crystalloid Responsiveness Among Initially Hypotensive Patients With Sepsis and Septic Shock. Crit Care Med. 2018;46:189-198. Williams JM, Greenslade JH, Dymond CA, Chu K, Brown AFT, Lipman J. Characteristics, treatment and outcomes for all emergency department patients fulfilling criteria for septic shock: a prospective observational study. Eur J Emerg Med. 2018;25:97-104. Gelbart B, Glassford NJ, Bellomo R. Fluid Bolus Therapy-Based Resuscitation for Severe Sepsis in Hospitalized Children: A Systematic Review. Pediatr Crit Care Med. 2015;16:e297-307. Glassford NJ, Eastwood GM, Bellomo R. Physiological changes after fluid bolus therapy in sepsis: a systematic review of contemporary data. Crit Care. 2014;18:696. Marik P, Bellomo R. A rational approach to fluid therapy in sepsis. Br J Anaesth. 2016;116:339-349. Marik PE, Malbrain M. The SEP-1 quality mandate may be harmful: How to drown a patient with 30 mL per kg fluid! Anaesthesiol Intensive Ther. 2017;49:323-328. Finfer S, Myburgh J, Bellomo R. Intravenous fluid therapy in critically ill adults. Nat Rev Nephrol. 2018;14:541-557.